First, let me thank Dana from The Stone Rabbit for letting me use her wonderful idea for this post! 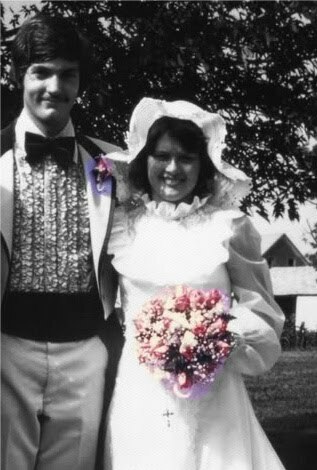 Thirty three years ago today, Bob and I were married at a beautiful Catholic church in Wien, Missouri. Our wedding was large for the time but these days I think it would be considered an average sized wedding! Bob has always been a romantic and his proposal was every bit as wonderful as a girl could imagine. There was a roadside park between Marceline and Brookfield that we used to picnic at quite often. Bob prepared a picnic dinner, and there at sunset, Bob got down on one knee and proposed to me. I guess it is obvious that I said yes! We chose our wedding colors from the colors in the sky during the sunset, pink, lavender and blue. Bob purchased my ring in Kansas City at a store called Dolgins. His parents loved to shop there and it was always such a fun place to go. He picked out a beautiful solitaire diamond ring with a band that wrapped around it for the wedding ring. I bought Bob's ring in Brookfield. I found it, loved it and bought it without even asking him! It has three kinds of metal: 14k gold, 14k white gold and 14k rose gold with a part that is antiqued. It is still beautiful after all these years! The scary part? I was 18 and Bob was 19. Just kids ourselves. I always wanted to be a June bride. 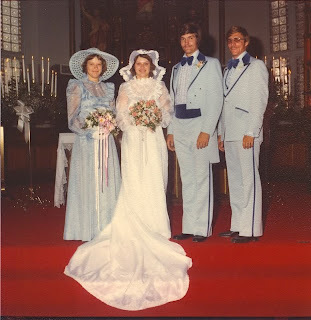 I don't really know why because I don't remember going to a lot of weddings in my youth. It probably was the closest time after graduation I could get! I ordered my invitations, napkins and favors from a paper place in Kansas City. 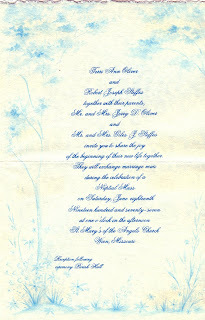 Bob and I were married at St. Mary's of the Angels Catholic Church in Wien, Missouri. I was a Baptist and Bob was the Catholic one. I had to go through some "instruction" on how to be a good Catholic wife with a priest who didn't like me very much. Bob's mom became my godmother. I was so grateful for her guidance! One thing I wanted for sure was a big wedding cake! I had a lady from Wien make my cake and we had such a fun time designing it. We had a lot of cake but we didn't have much left over! 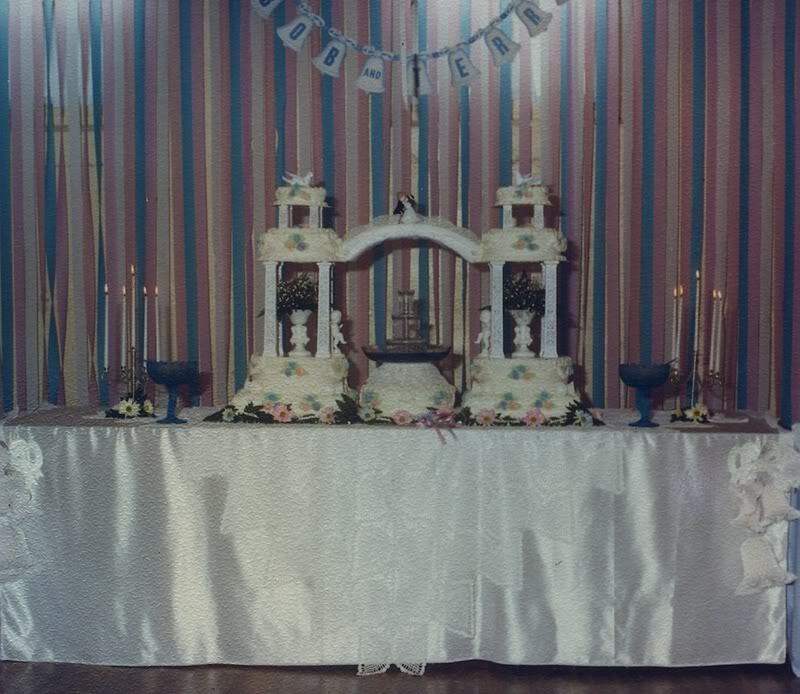 The cake table was covered with a crocheted tablecloth made by my great-great grandmother. The blue bowls were won by Bob at the Marceline 4th of July Carnival the year before we were engaged. The cake topper was used by Ashley and Eric on their wedding cake. I ordered my flowers from the Marceline florist. I love daisies and used a lot of daisies in pink, lavender and blue. My bouquet was lovely and had Sonja roses, babies breath and stephanotis. A crystal rosary was intertwined through the bouquet that was a gift from my mother in law. We had sprays of gladiolas on the altars and on the candelabra. The boutonnieres were daisies and lilies of the valley. Boy did they smell good! Bob's boutonniere was stephanotis and a rose pulled from my bouquet. 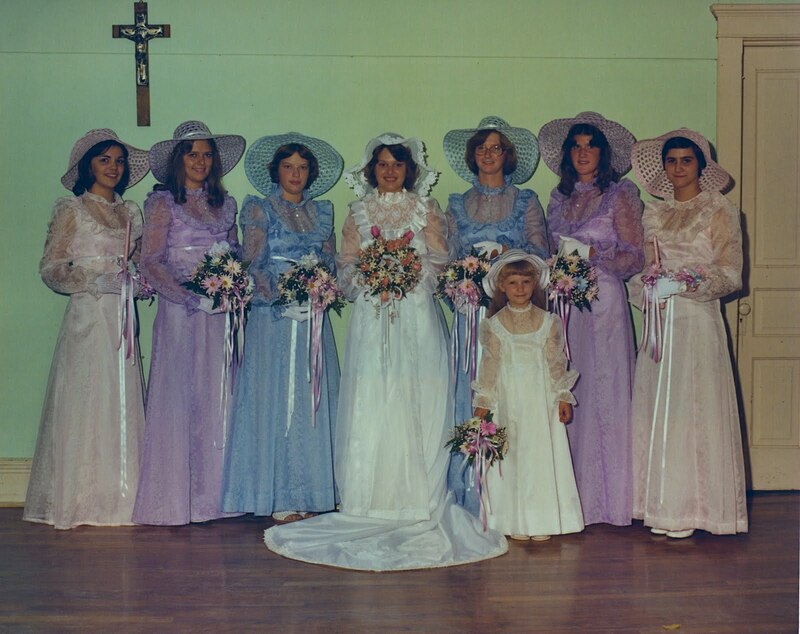 My sister and sister in law wore blue dresses made from flocked organdy. They mimicked the neckline of my wedding dress. The bridesmaids wore lavender and the candlelighters wore pink. The flower girl wore a white version of my gown. Everyone wore floppy hats. I am sure they are a 70s fashion statement! I wanted to have my dress custom made. I ordered fabric and lace from a warehouse in France. I ordered lace medallions from Paris, too. My seamstress and I sewed on thousands of pearls all over the dress. It took hours and hours to get all the pearls on that I wanted! I wore platform heels and a white organza hat that had ribbons that went all the way down the back of the dress. I had the train on the dress lengthened an extra two feet! Our day started off a bit rainy but that was a good thing since rain is a Steffes family good luck omen! It also settled the dust on the roads of my country wedding. We left Marceline and got to Wien to get ready. I remember my cousin Stephanie was so excited! She kept going back and forth from me to Tammi saying "this is so cool." Darren, who was the ring bearer, thought HE was the one getting married and told me he had changed his mind! I will be the first to admit that our life together has not been perfect. I was a headstrong bride who was very bossy with her husband. I couldn't make up my mind about what I wanted to be "when I grew up" and that caused a lot of stress.... plus I was a bit of a prima donna.... we've had our ups and downs as all married people do. I have learned a lot about how to accept and give forgiveness. I wouldn't exchange one minute of our married life for anything different. All the growing pains have lead to what we have now... partners for life in this crazy world. Since I have a blog and Bob doesn't, I can tell the world how much I love him and there isn't much he can do about it! Thank you God, for the blessing I call Bob! Linking to Wedding Blog Party 2010 ! Oh I remember the day so well...it was beautiful...beautiful little country church and now in just a week I get to celebrate another beautiful wedding in that same church, my daughter Alyssa...I pray her marriage is as blessed and happy as yours and Bobs...Congratulations you guys...I love you!!! This post is beautiful all the way through...but...that last paragraph is so very powerful. I wish more people would learn the joy that comes from working through the issues that all married people face. How this bonds us to our spouse. I wore the floppy hat in 1989. So it wasn't just a '70's thing. And my flowers were peachy too. Happy Anniversary to you!!! Thanks for sharing the pics from your sweet wedding with us! I agree that it is important for young people to understand that you don't give up when things aren't perfect. You work together to make them better. How neat that you two are still together and loving it after all these years! I had that same hat for my junior prom. Love all the pics too! Happy anniversary! You picked a WONDERFUL day to get married - and thanks for the birthday wishes! I remember Dolgins here in KC - I had forgotten about that jewelry store! What a beautiful wedding you had! Happy Anniversary! Enjoy the celebrating. Terri, this is such a lovely post. You need to participate in the Wedding Blog Party next week at Stephanie's. She would love it have you. The button is on my sidebar. I wish you and Bob many, many more years of happiness. A blessed and happy anniversary to you and Bob Terri! Such a lovely story you tell...and so very true...as you say...marriage isn't always perfect it is a living breathing being that must be nurtured and fed...forgiven and loved...unconditionally! You are so wise. Thank you for sharing with us. 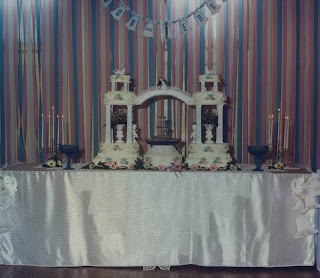 Love the old school cake with the bridges and all, classic! OMG, Terri, your Anniversary Post is WONDERFUL!!! I so enjoyed reading every word..and I was so struck that our pasts/weddings were similar in so many ways!! Well...you went over the top with ordering that French fabric..I got mine at a local store!! :) Our religious backgrounds were exactly the same....so you knew what I was talking about in my post, didn't you? I don't know where you guys attend church now, but the priest who married us in KC was Monsignor Michael McAuliffe....who went on to be the Bishop of the Jeff City Diocese. I recall being very upset with him because he wouldn't allow us to have the traditional wedding march...and ONE WEEK after we were married, one of my husband's best friends was married at Visitation Church (then it was a hoity-toity church) and that priest allowed that song. I was angry at The Church over that for a long time....but I got over it and converted when our youngest was 6 mo old...and I've always been glad that I did. Well....you did an outstanding job on this post!! I loved it....bet Bob did, too! I'll come back and catch up on your other posts...I've got an exercise class to go to. Please know you are in my prayers....your feet will be the hit of the hospital!! 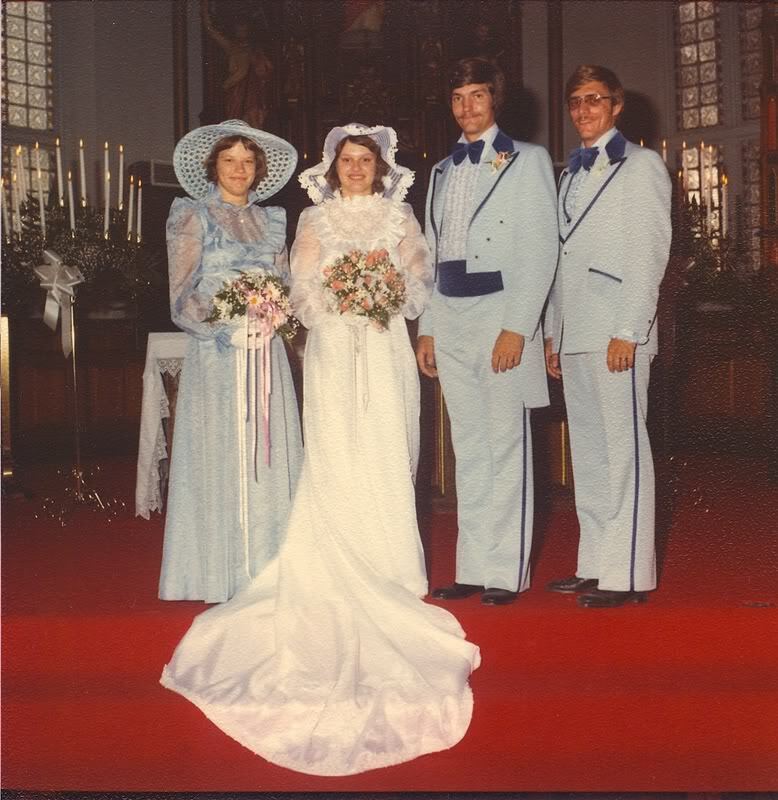 Hi Terri yes you are right, the men had on the same kind of tux..blue was so IN then..when my kids first saw our wedding pictures as adults I thought they were going to roll out the door laughing, but style is style..lol. What a lot of thought that you put into every detail, from the cake to the platform heels (love that!)... this is such a fun event. Love to see everyone's special day. Thanks for sharing. 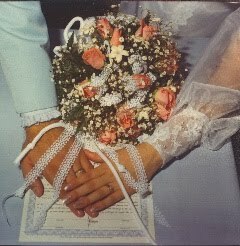 I am so enjoying seeing everyone's photos & hearing about wedding memories. And I am happy to hear someone spout the truth about marriage. It isn't always a bed or roses. It does have it's ups and downs. But hopefully we can endure the changes & come out as better people in the end. It's always nice to have someone to share our lives with. Terri, you put so much thought and love and HEART into this wonderful wedding post! I love all the pictures. My bridesmaids all wore the floppy hats, too, back in '74! My colors were pink and lavender and I used lots of daisies and stephanotis, also. Love your gorgeous cake and that sweet bridge with the bride and groom on it. How very special to be able to use the crocheted tablecloth of your great-great grandmother's! You are so right, life has its ups and downs but if we persevere we will only come out stronger! Happy Happy Anniversary to you and Bob! Thanks so much for joining in the WEDDING BLOG PARTY! G'morn, Terri ~ Beautiful & powerful write ... I love your wedding color choices ... moments to treasure forever.